China is the biggest market in the world for mobile gaming, and so it’s not a surprise that the two biggest companies that are allowed (by the Chinese government) to capitalize on that region are battling over the top spot as the No. 1 mobile publisher in the world. NetEase has replaced Tencent as the top mobile publisher by revenue worldwide as the company’s apps continue to grow in China. 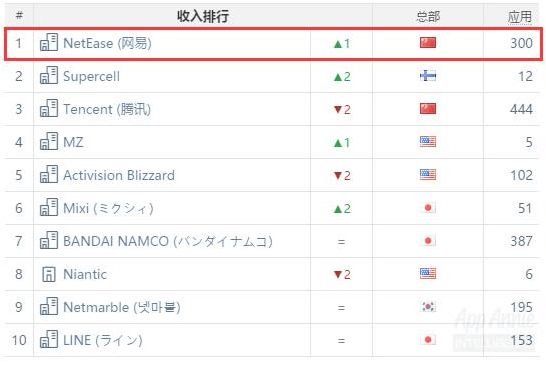 According to App Annie, NetEase was in front of both Tencent and Supercell (which is a subsidiary of Tencent) in October. The big reason here for NetEase’s surge is that it has the top two most lucrative games worldwide with the card-battling Onmyoji game and massively multiplayer online adventure Fantasy Westward Journey. Above: NetEase tops the charts. Of course, all these apps are primarily popular in China, which is worth $7.1 billion on its own. But unlike markets like the United States and Japan, China has some governmental systems that make it much more difficult for foreign developers to release their games. This gives a built-in advantage to Chinese companies like NetEase and Tencent beyond their capability to appeal to the cultural sensibilities of mobile gamers in their home country. While companies like Activision Blizzard (which owns Candy Crush Saga developer King), Game of War developer MZ, and Monster Strike studio Mixi would love to launch all of their news games in China, it’s not as easy as pushing the “publish” game on the iTunes store. The Chinese government demands to look at any foreign game before it can go live on in that country. And getting that approval almost universally requires that foreign developers work with a third-party that is based in China, which can significantly eat into profits. But for NetEase, this is a sign that its efforts to focus on Chinese mobile gaming is paying off, and the publisher should have a strong future as more and more people in that country come online with smartphones as its economy improves.